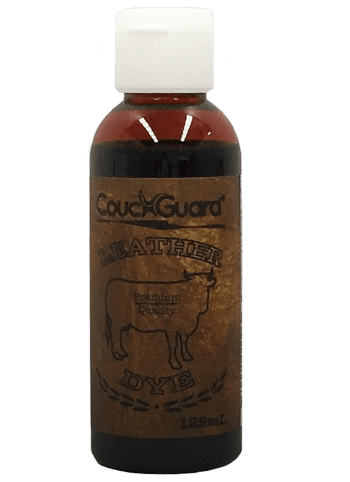 Premium Leather Dye from CouchGuard® is alcohol based formulated for Aniline Leather and Vegetable Leathers. CouchGuard® Leather Dye comes in a range of assorted standard colours but you can mix any of these colours to make your own. Our formula is designed to penetrate. Alcohol based formulated to penetrate the leather surface. Dilatable with water for lighter shades. Designed especially for Aniline & Vegetable tanned Leathers. CouchGuard® Premium Leather Dye's will not crack, peel or wash off. 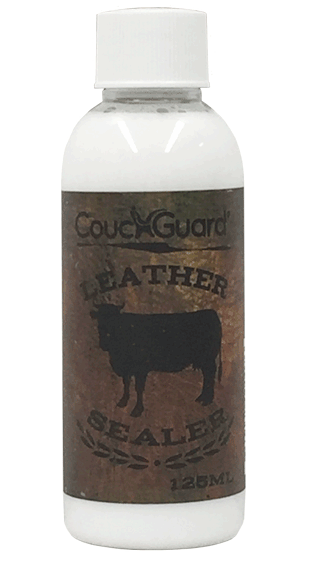 CouchGuard® Premium Leather Dye's are easily applied with a wool dauber, damp foam brush or soft dye applicator pad. CouchGuard® have 16 stock base colours available ready for you to mix n match that perfect colour. Just apply the CouchGuard® Premium Leather Dye in even, circular motion. Allow to dry, buff before applying our Leather Sealer. Australian made Premium Leather Dye is alcohol based. Great adhesion with assorted colours. Formulated for Aniline Leathers and Vegetable Tanned leathers that have no sealer so they will take on moisture. This means the Leather Dye will be soaked up so you want to avoid uneven dyeing by wetting your dauber or brush and moisten the leather before dyeing. Once dry, buff the surface before applying our Leather Sealer. Remember, Leather Dye has no uv properties. Thats why your Aniline Leather couches fade quickly. Our stock colours include Oxblood, Russet, Mahogany, Chocolate, Tan, Orange, Dark Brown plus standard colours like Black, Bright Red, Blue, Green plus more. Being Waterborne technology, there are no smelly solvents with easy clean up with water. How does leather dye differ from leather paint? Leather dye takes on the colour it is being applied to. So if there is a mark in the leather, that mark will show through after the dye has been applied but the colour of that mark may vary. Leather Paint will cover anything. However, you change the Aniline Leather to Pigmented Leather by doing so. Leather Dye is for Aniline Leather and vegetable crusts, is alcholol based and requires a sealer to be applied afterwards. Can I mix the dyes to make any colour? Yes you can but mixing Leather Dye is much different to mixing Leather Paint. Adding 1 or 2% of dye to another colour can change that colour a lot. Adding water to our dye will lighten the colour. Is there a white leather dye? No. There are no white leather dyes in anybody's Leather Dye colour range. If a company is showing a White in their colour range its probably pigment which is Leather Paint. You can read more about Leather Paint by clicking or tapping on the link in the last sentence. Do I have to seal the dyed leather after? For best results and to stop it wearing or transferring, yes. 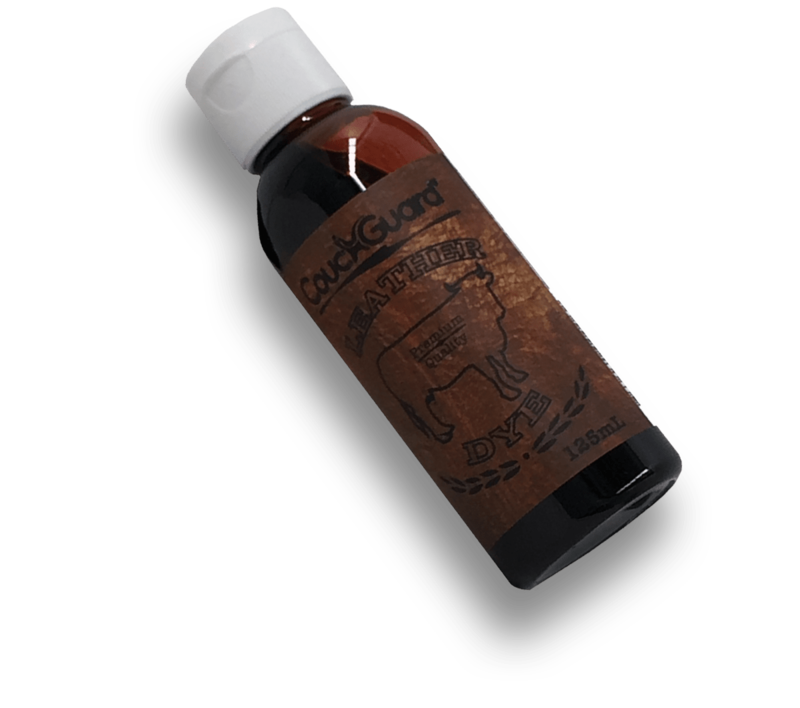 CouchGuard® has three finishes in our Waterborne Technology Leather Sealer. Dull, Satin and Gloss.